I have tried several other products from Adovia, including this one and have had a pretty good experience with them all. This gel goes on easily and feels cool going on, but I didn't like that after applying the product around my eyes, there was a bit of a burning feeling. However, the burning sensation only lasted maybe 30 seconds or so. My only other issue was that it didn't absorb as fast as other products I have used in the past, but it's not bad. I have really dark, purple under eye circles and having pale white skin doesn't help either. I didn't see much a huge difference in reducing the appearance of my dark circles but it did help.. And, to give this product credit, again the my dark circles are bad, so when I say that this helped, I'll take it! And, it really helped with the puffiness and it did seem to leave the eye area feeling more moisturized. I have noticed the fine lines around the eye area are becoming less noticeable and I think that is because they're more hydrated. But, overall I liked it. I would definitely recommend this product if you're looking for an extra boost of moisture for around your eyes and to help and reduce the appearance of dark circles. 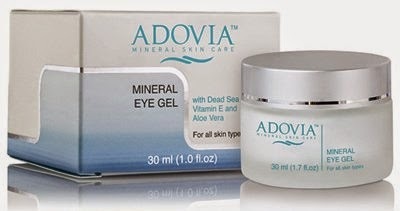 If you would like to try them out for yourself, you can purchase this Adovia Eye Cream - Powerful Eye Gel for Eye Puffiness, Dark Circles and Wrinkles right now from Amazon!